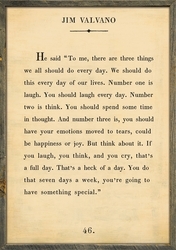 He said, "To me, there are three things we all should do every day. We should do this every day of our lives. Number one is laugh. You should laugh every day. Number two is think. You should spend some time in thought. 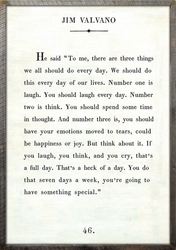 And number three is, you should have your emotions moved to tears, could be happiness or joy. But think about it. If you laugh, you think, and you cry, that's a full day. That's a heck of a day. 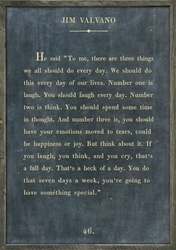 You do that seven days a week, you're going to have something special."